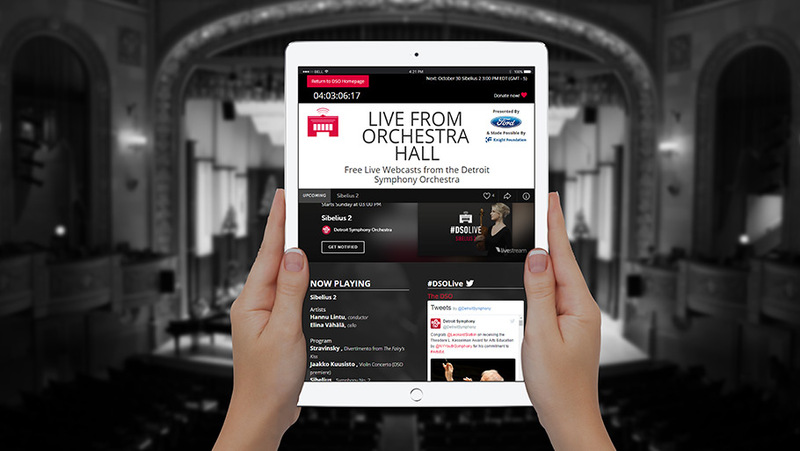 In 2016 the Detroit Symphony Orchestra approached Media Genesis to redesign and update their live performance page (https://www.dso.org/live). The main function of the page is to broadcast live concert events in the embedded video player supported by Livestream. The goal of the redesign was to maintain the page’s overall aesthetic while maintaining core functionality such as the countdown to the next performance, schedule and concert information, timed donation pop-up copy, Twitter feed and sponsor information. Additional requirements were to incorporate the DSO Live’s sister products, Replay and Classroom Edition. The design incorporates the elegance and simplicity of the rest of the DSO website with full bleed banners and consistent style. DSO patrons are able to enjoy live performances while easily scrolling the page for live Twitter updates, upcoming concerts and more.